We had a pretty traditional Thanksgiving dinner this year. Matt brined a turkey & then rubbed it with an herb butter before roasting, He made gravy, adding the reserved bacon fat from this dish to it for extra flavor. My sister made mashed potatoes & the basic onion & celery bread stuffing (my family will never have any other stuffing). My mom made creamed onions, broccoli & cranberry/cherry relish. The whole thing was followed up by pumpkin pie of course. My one contribution was this sweet potato and apple bake. Matt found the basic recipe from the local restaurant Fire Lake on Heavy Table. I decided a little bacon would only make it taste better. We weren't sure how this would go over since sweet potatoes are usually part of my family's Thanksgiving dinner but it was a hugh success! Every single bite was eaten. 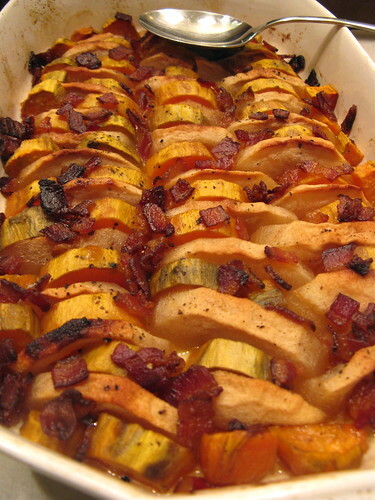 I have to say my favorite part of it was the apples, they got such a wonderful texture from the baking & their flavor was the perfect compliment to the sweet potatoes & bacon. 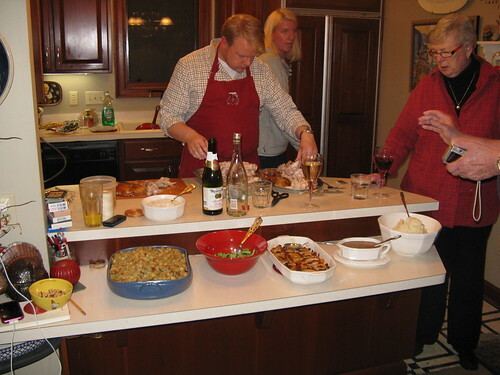 We won't wait until next Thanksgiving to make this again. Next time though we might add a little heat like some cayenne. Cook the bacon until crisp. Drain on a paper towel & set aside. Peel your sweet potatoes & apples. Core the apples. Slice the apples in half top to bottom & the sweet potatoes lengthwise. Cut both into about 1/2-inch slices. Arrange the slices in a baking dish (our dish was a little smaller than a 9" x 13"). Drizzle the maple syrup over the top. Sprinkle with brown sugar. Season with salt & pepper. Scatter the bacon over the top. Cut the butter into slices & place around the top. Mmm. 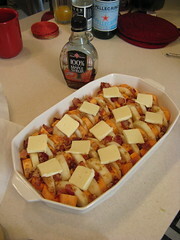 Maybe it's the proximity to lunch time, but that sweet potato bake is totally making me drool. Bacon definitely makes everything a little better -- and I think it's wonderful when the salty is paired with sweet. Those sweet potatoes sound amazing! sounds like a nice spread, with your taters here being particularly appealing. those apples sound uniquely delicious and i sure wish i had a few to munch on myself. love this girl! keep on making them sweet potatoes--I will never tire. This sounds like such a great flavor combination. nice. i saw your photo on FoodiePhoto and came to your site. Going to make a version of this for Gardenfork.tv . Have not seen Frostbite apples on the east coast here. wondering if Mutsu would work? Oh that looks good! I could have a bit of cheese with that and call it a meal! I like your idea for adding cayenne, but what about some chipotle in some form? I can just see the smoke adding good things! Foodycat - Matt thought chipotle might be good as well.